unbeatable views from the sunset deck. Epic Seaboard sunsets in shorts and slops on the Corona Deck, tucking into scrummy (and surprisingly affordable) meals while the kids make their own pizza – Strolla tonight anyone? 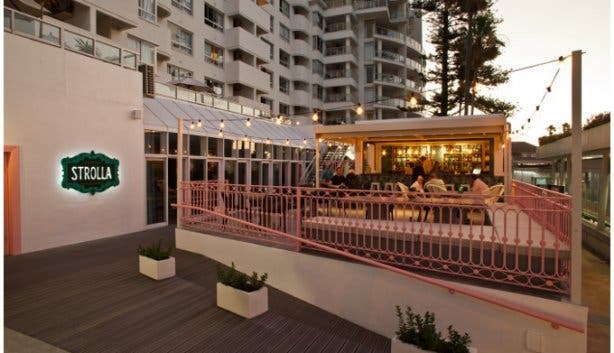 Strolla Restaurant & Bar is a lot like the Sea Point Promenade it presides over – it’s elegantly casual, has great sea views and has something for everyone, whether you want to toast a cocktail on their refurbished Corona Sunset Deck, savour a morning coffee on the outside terrace or enjoy a plate of fresh fish and chips from their indoor restaurant. Even the kids are catered for, with a dedicated area that lets them put on their own chef’s hat and apron on and make pizzas, all under trained supervision of course. 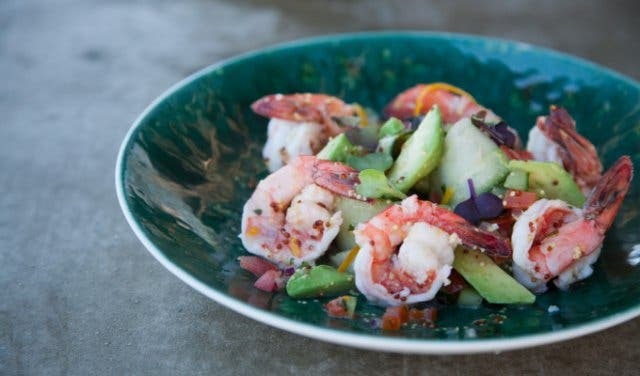 It’s what Capetonians have come to expect from seasoned restaurateur Brendon Crew’s range of lekker local eateries. Like the equally popular Prom, Strolla is a fuss-free zone. From the laid-back food to the casual dress code, this is one restaurant that embraces its cool seaside status. Shorts and slops are as welcome as kids and big groups. 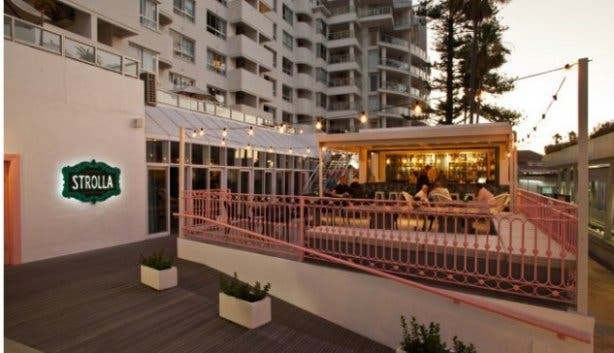 It might be perched like a cheeky seagull on the edge of the Peninsula Hotel in the heart of Sea Point’s Platinum Mile, but the atmosphere is as refreshing as the sea breeze that pulls in for a quiet cocktail on their beautiful Corona Sunset Deck. You wouldn’t know from its relaxed vibe that it can actually seat up to 140 guests and even caters for weddings. Actually, that’s not exactly true. Strolla hosts weddings, as in, the whole thing. The upstairs deck, with its sweeping sea views, transforms into a romantic pulpit while the downstairs terrace and indoor restaurant cater for the eating, dancing, toasting part of the celebrations. 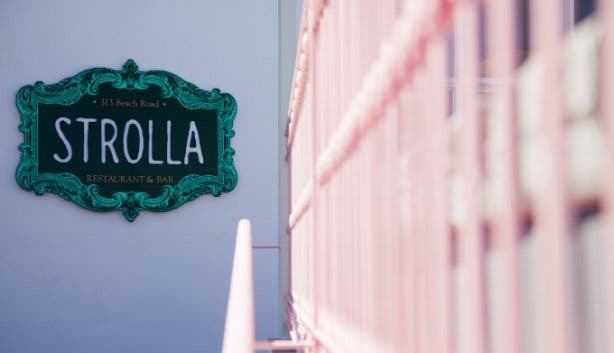 And with five different sections, each with their own vibe and décor, it’s no wonder Strolla is a popular venue for birthdays and special celebrations. A lot of restaurants are catching onto the “kids friendly” vibe by creating kids entertainment areas or child-friendly menus. 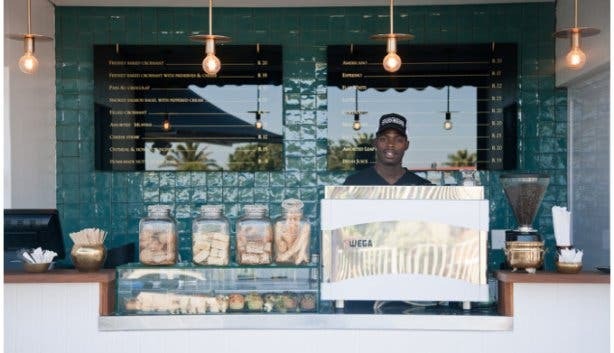 Strolla takes it to the next level by combining the two, creating a dedicated kiddies corner that allows kids to actually make their own pizzas, complete with their own aprons and chef’s hats and a supervised guide. 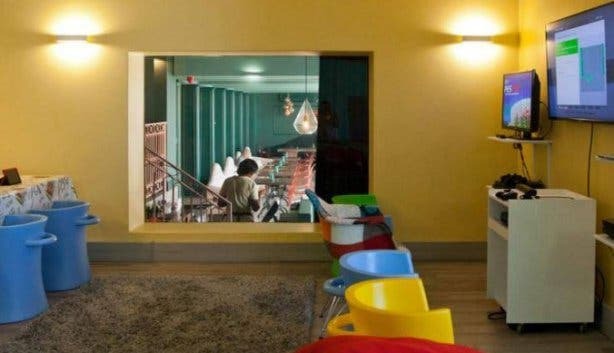 Then there’s the fully-equipped games room complete with bean bags, games, colouring books, a PS4 and a DVD player/DSTV with a range of child-friendly movies. It’s the perfect recipe for fun family time, whether mom and dad choose to enjoy a signature cocktail (this is one of our favourite sundowners spots, after all) and nachos on the Corona Sunset Deck, or tuck into Strolla’s famous Portuguese Steak on the terrace or inside the restaurant. 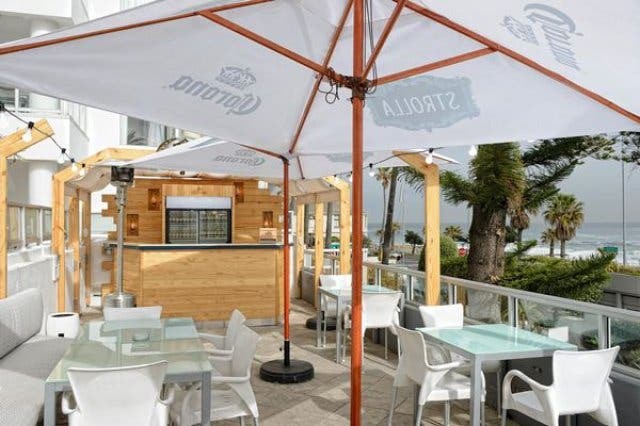 With indoor and outdoor venues, summer and autumn decks, Strolla is not about the winter specials, it’s about adding value, every day, no matter what the month or weather. This is especially true on Wednesdays and Fridays when they offer their free live music. On Wednesdays, Strolla pairs a delicious all-day rotisserie chicken feast for half price with live music, which starts at 6pm downstairs. 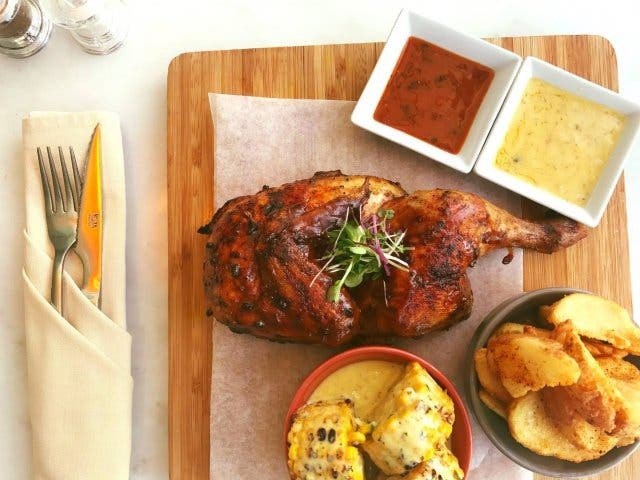 And when we say feast, we mean it – expect a delicious half chicken served with mielies drenched in golden butter goodness, chunky potato wedges, peri sauce and the best lemon-butter sauce your taste buds can imagine. Check out Strolla’s half-price rotisserie chicken every Wednesday. And if that’s not music to your ears, you know the live reggae on Saturdays from 3pm. 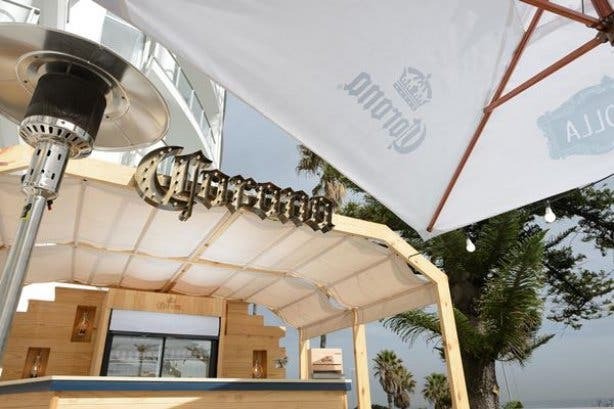 It’s the perfect excuse to skip rush hour traffic to chill on the Corona Sunset Deck with a cold craft beer, cocktail or one of their signature lemonades while you watch the sun dive headfirst into the sparkling sea. There’s only one thing better than a morning walk along on the Prom and that’s a morning walk that ends at Strolla’s outside terrace. Here you can grab a steaming hot coffee for half price between 7am and 9am. And we’re not talking filter coffee either. We’re talking Bootlegger Coffee at its barista best. Flat white, Americano, it’s your choice and their pleasure to serve the morning crowd that gathers on the beautiful outside terrace to covet their daily treat. With 140 seats and a choice of five sections to rent out, you can always match your perfect celebration with the perfect setting. Want to host an elegant cocktail party with incredible ocean views? The Corona Sunset Desk is perfect for toasting in the golden years and sun in suitable style. We recommend trying one of their cocktails. They have all the classics, but it’s their signature styles that are worth toasting, again and again. Think Apple Cognac Sour and Salted Caramel Old Fashioned. And for the virgin crowd, there’s a refreshing range of flavoured lemonades. Think old-school homemade lemonade with an infused twist like kiwi, mango or strawberry. The sprawling outdoor bar section, with its beautiful overhanging lights, is great for dancing the years and office party stress away. 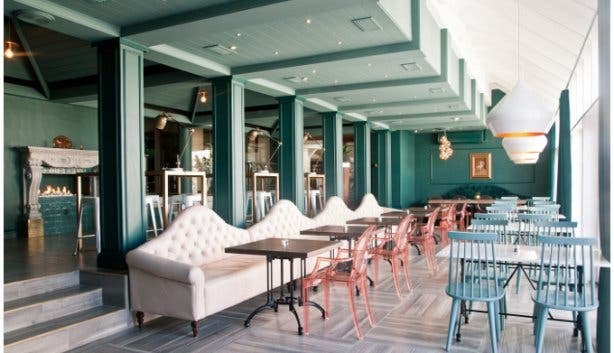 And if décor and design is your thing, you can count on the indoor restaurant, with its unique teal and gold colour scheme and elegant couches, to bring style to your next birthday bash. The food and wine selection are equally flexible and stylish. 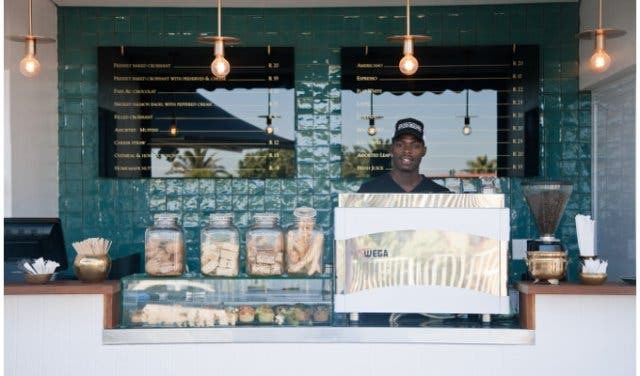 With fresh, fuss-free items driving the menu selection, you can choose from a range of platters (including banting) or individual feasts like pizzas, burgers, Saison Fish and Chips, Portuguese steak and even warm winter soups. And with an extensive wine list, craft beers, MCCs and even high-end Champagnes, your guests will be toasting to your good taste, too. Tip: Try the deep-fried goat cheese with sweet basil ice cream starter. It’s the King of Prom. Get irie at Strolla with reggae bands on Saturdays. 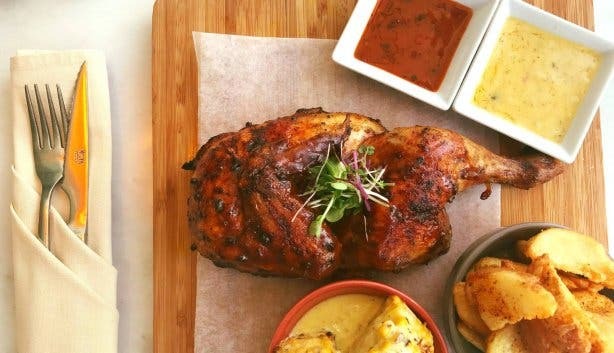 Tuck into (you won’t believe how good the buttered mealies and lemon butter are) half-price half chicken rotisserie at Strolla every Wednesday. Have kids need food? 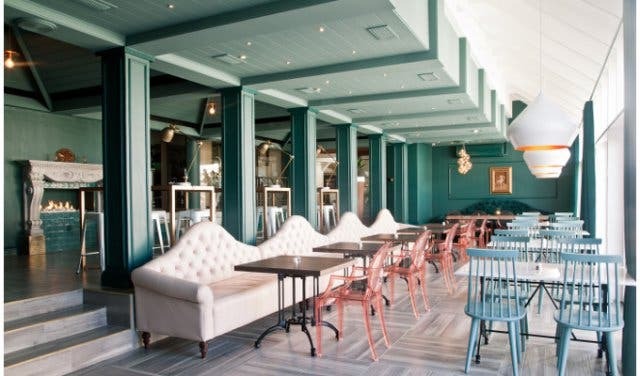 Check out our list of top kid-friendly restaurants in the Mother City. Birthdays should be a time to celebrate. We think our top birthday party venues are worth toasting, as are these fabulous restaurants with sea views. 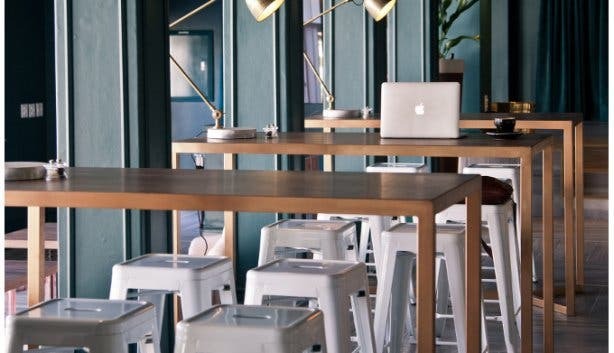 Looking for a cafe that merges New York style with Paris, try out Coco Safar in Sea Point. A natural playground for adventure junkies.